Left to Right: Kara Jacobson, MPH and Heather Turkoz, M.A. 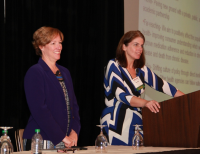 Heather Turkoz and Kara Jacobson used their experience to illustrate to other healthcare professionals how a collaborative approach to testing can create highly effective health communication material. Their collaboration is a case study on how a company, like Merck, can partner with a diverse set of stakeholders, like Emory University and Northwestern University, to improve its patient communication. In this case they partnered to improve Merck’s patient labelling process through evidence based market research facilitated by Emory. Their collaborative approach included the application of health literacy principles into a newly designed patient package insert and implementing new market research methodologies to solicit and incorporate feedback from respondents of all health literacy levels. After implementing health literacy best practices into the patient package insert, research showed that the average comprehension scores were 93% across all subjects with no meaningful differences between those with limited health literacy and those with adequate health literacy. Turkoz and Jacobson provided new perspectives and insights on a model for building an effective partnership between industry and academia to affect real change and improvement in health literacy. In order to develop patient labelling that was well understood and actionable, application of best practices from the field of health literacy was required. These methods are commonly used within the field, but not within the pharmaceutical industry. These included identifying and recruiting patients with limited health literacy into the research and refining the methodologies to assess comprehension of medication information. The presenters also emphasized the importance of including an iterative method to incorporate patient and caregiver feedback into the development process of patient communication. The recruitment and screening techniques for populations with limited health literacy were shared and can be applied by participants from other large organizations within the health industry. Furthermore, their testing methodologies can be used with a broad range of patients, inclusive of all health literacy levels. Lastly, they shared implications for future development of patient communications that go beyond the patient package insert.